Carl Heilman, II Copyright Fort Ticonderoga. Late last October, a lazy fall Sunday awaited my family. But who wanted to laze when we could do something truly autumnal, like get lost in a corn maze? I’d heard good things about Fort Ticonderoga, and their Heroic Maze that challenges visitors to find sets of clues in order to unlock a puzzle — and find their way out of the corn. So we piled Dillon and Harper, then ages 9 and 8, into the 4Runner and drove an hour and 20 minutes from our home in Shelburne to the historic New York site that was captured by Ethan Allen and the Green Mountain Boys on May 10, 1775. During our trip, however, what captured our attention were the tall stalks of corn, just north of the King’s Garden and an apple’s throw from the southern end of Lake Champlain, rustling slightly in the breeze. We heard laughter and shouts from somewhere inside as we received our Quest Cards from a small shack near the entrance (the fee is covered by general Fort admission — $21 for adults, $9 for children ages 5 to 12 and free for kids 4 and under) and looked at the rules. The main one? Stay on the paths; no cutting through the corn. We were game. Dillon, Harper, my husband, Carlton, and I entered the maze with optimism. How hard could it be to find our way through? Lunchtime was approaching, but, no problem — we’d be done in 30 minutes or so. But reality crept in as we turned corner after corner, becoming increasingly lost in the corn. Still, the Quest Cards kept the kids occupied as they gleefully stamped a box each time they found a station with a stamp showing a component of an 18th century fort. “Do we really have to get all eight stamps?” I asked, my stomach starting to grumble. “Yes!” said Harper defiantly, stamping his foot on a trampled corncob. “I want to see what we'll win!” His sister agreed. So we forged forward through the maze, and then backward, until we were lost again. Lunch? We’d be lucky if we got out of there by dinnertime. Then there was hope, as I spied the roof of the entrance shack. Surely we were near the end. One or two more turns and... Whoops! Back into the thick of the corn. Forget it. I defiantly turned my back on my family and cut through the corn to find myself facing the parking lot, relieved to be back in civilization. Ten minutes later, the other, much more honest, three quarters of my family found me, and chastised Mommy for breaking the rules. We didn’t get all eight stamps on our Quest Card. Later, though, as we laughed at our silly escapades, we all felt like winners. 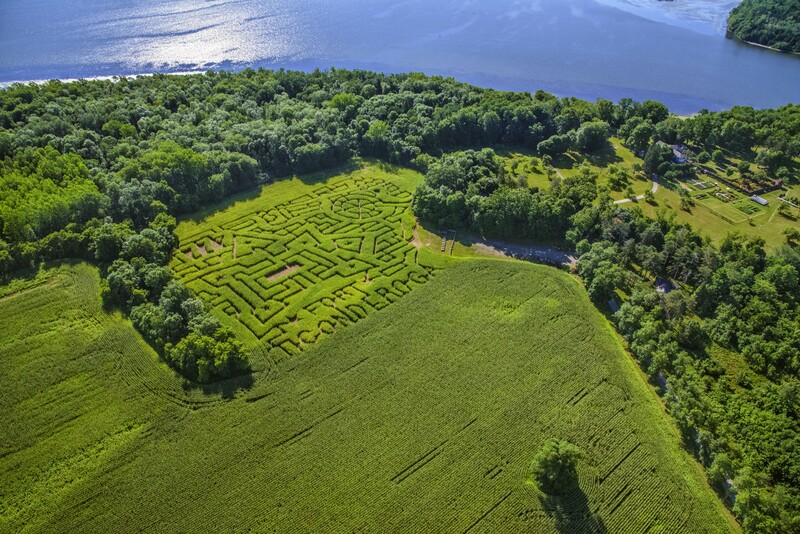 Fort Ticonderoga's Heroic Maze: A Corn Maze Adventure! is open on Saturdays and Sundays, from 10 a.m.-5 p.m., through Sunday, October 15. There is a kiddie maze for young visitors in addition to the larger maze. On Friday, October 27 and Saturday, October 28, a Maze by Moonlight event gives visitors the opportunity to explore the maze after dark. Visit Fort Ticonderoga's website for more information.